The building made headlines last week as news that the council was auctioning off the property with a reserve of £2.25 million earned it the title of “the most expensive council house in Britain”. 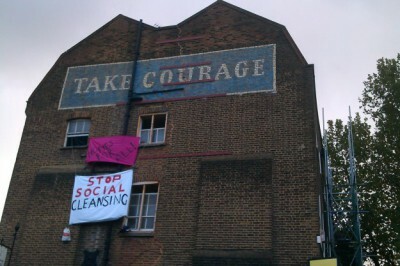 On Monday, just as news that the property had been sold for £2.96 million began circulating, it also became clear that the building had been occupied by local residents, some of whom are part of a new mutual support group called Housing Action Southwark & Lambeth, in an attempt to prevent the sale of yet more public housing. Having attempted to identify a number of possible offences, it became clear that police had no legal recourse to arrest the occupants, and they left. I visited the occupiers and was given a tour of the building. Subtle traces of previous occupants still littered the rooms of the building; children’s stickers and nails in the walls where pictures once hung, and a long discarded telephone extension cable strewn across the floor. People throughout the building were talking about their difficulties finding decent housing in the area. Expressions of the basic desire to live in the places they have come to call home. I briefly spoke to a number of those occupying the building about their reasons for taking action and their opinions on the housing crisis affecting the borough. Occupied Times: Why did you choose to occupy this particular building? Occupiers: This building was on sale with a starting price of over £2 million which I guess just symbolises the totally ludicrous state of the London property market at the moment. But for us it was simply yet another council house that was being sold and, if we can stop that, if we can keep this house as common property instead of being sold off to some private property developer who is going to turn it into luxury apartments, then that’s something that is worth doing. This is public property, and at a time when people are desperate for housing in Southwark every piece of public housing which is sold off denies people a chance to be housed. There was no mandate to sell the building and the argument that the money from the sale is going to be used to reinvest in new council housing doesn’t seem to come from a council whose actions hold true to their word. But this is also wider than this one building. It’s about the loss of public/council housing across London – whether that be through its sell-off or the loss to tenants evicted due to bedroom tax arrears – and if we can challenge that, hopefully more people will take direct action to defend all of our homes. OT: How does this building fit into a larger process of gentrification across Southwark, and London as a whole, for a number of decades now? O: In the context of gentrification, this building is situated in a particularly important place. It’s slap bang in the middle of the small area where the gentrification of Southwark actually began, just next to the Tate Modern and Borough Market. It’s backed onto by social housing which is finding itself more and more out of place with its surroundings. The council say they’re going to build 20 council houses “somewhere else”, but the point is they’re not going to be here. It’s taking publicly owned property in an area with higher housing prices, selling it off and forcing any potential social tenants to find housing further out. That’s definitively social cleansing in action. It’s important that people with low incomes, who work and have lived in Borough for many years, have the right to live in their area. But it appears that the council don’t feel that these people do have that right. They’ll just put you somewhere out on the fringes of Southwark. OT: How is this part of a larger project to defend people’s homes? O: We want to raise the issue of council housing being sold off by councils across the country, particularly in London, where the housing crisis is especially severe: we know across the border that Lambeth Council are selling off short life properties and here in Southwark there’s been the Heygate estate, where thousands of social housing units have gone. All of this is being lost. The housing list in Southwark is disastrous. There’s 25,000 people on the waiting list and there is a huge waiting time before people are housed. If you’re ‘band 1′, which is for those with the most urgent need for housing, a one bed place can take up to eight months to find, for a three bed you’re looking close to two years. And that’s those in the most need even according to Southwark Councils criteria. Those with ‘lower priority needs’ are being forced to wait for years and years. People are then finding themselves forced to turn to the private sector or be made homeless, but if people are struggling to afford council rents, what possibility have they got of being able to afford private rates? OT: So that makes this occupation far more than symbolic then doesn’t it? O: This isn’t an academic discussion, there are people being made homeless right now because they’re not being provided with homes, and so, if people find a property, that could house people quickly, then suddenly this is about defending actual places where people could live. That’s the problem with these tired old promises of “twenty new houses” [the number of houses that Southwark Council claim they can build with the proceeds of the sale of the building], they don’t exist, if they ever will. We can’t live in promises, especially the kind that Southwark council make. There’s got to be a point at which we decide we’ve had enough of the resources which we all own being sold off in the name of a kind of progress that leaves most of us impoverished. If we can put a stop to a process that has destroyed our communities and entire ways of life surely that’s something worth doing?